The Scenery- Let's face it, the mountains are gorgeous and close. Whenever we are outdoors we have a spectacular view. 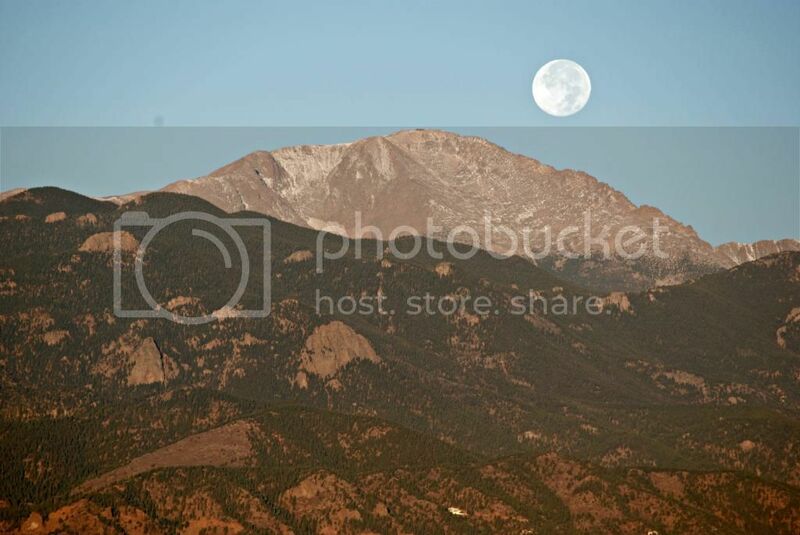 Pikes Peak is the most prominent mountain in our area and it often appears to be purple, which is where we get the 'purple mountain's majesty' phrase from America the Beautiful. The clouds roll over the mountains and create fascinating storms and cloud patterns. There's never a dull moment. We love hiking, camping and just being out and about in these great outdoors! Being closer to family- We were stationed in Korea before living here, so even just being in America is closer to family, but being in the West puts us within a day's drive from most people, and a good stopping point when people are on their way to somewhere else. Family is important and we love seeing more of them. Having a home- I know we could accomplish this in any location, but it is our first home! Home ownership has been a lot of work, but very satisfying. I've loved slowly altering the rooms to fit our taste and style. Tuesday was our one year mark in our home, and we are looking forward to our future here. We don't know how long we'll be stationed here, but we plan to rent out the home and come back. The layout- We all have things that drive us crazy about our town. The first thing I noticed was how weird some of the road designs and parking lots are. I've been in plenty of cities to know that it is possible to make a usable parking lot, or to have roads that go over train tracks so you don't have to back track a few miles to get to a main road. Lots of things don't connect, names of streets change to a new name, and then back to the old one. It's kind of annoying. The food- After the plentiful amount of amazing ethnic food that was at our disposal in Korea, we've become food snobs. We don't want chili's or applebee's, we want the good local mexican restaurant, the good thai place, even indian food. We have yet to find something that we love. We've visited family and friends in the past year and enjoyed their local cuisine, but still not much here. Kind of a bummer. Our ward boundaries- The LDS church sets boundaries in a city so you know which congregation you are a part of and to help keep some wards from being tiny and others being huge. Well, our boundaries include the whole of Ft. Carson, and a skinny West-East line of homes. Well, we don't live on post and live closer to two other church buildings than the one we are assigned to. There are folks in our ward who can see the church building and have to drive clear east to the Broadmoor area to attend church. Our ward uses that building, but the building is not even in our stake. It takes 15-20 minutes to get to. We've driven that far for church, but not when passing two other churches.... kind of a pain. Love the people in our ward, but hate driving that far, especially in winter. Summer's Over and We're Back to Blogging!